The women who engage in the fishing industry in Carriacou and Petite Martinique were highly commended for the sacrifices they have been making over the years. Commendation came from Minister for Carriacou and Petite Martinique Affairs and Local Government Hon. Kindra Maturine-Stewart who was speaking at the certification ceremony for fisherfolk who participated in a Hazard Analysis and Critical Control Point (HACCP) Training on the island of Petite Martinique. Minister Maturine-Stewart noted that the 500-acre island can be described as the fishing capital of the tri-island state, therefore any training that can positively impact the sector is welcomed. 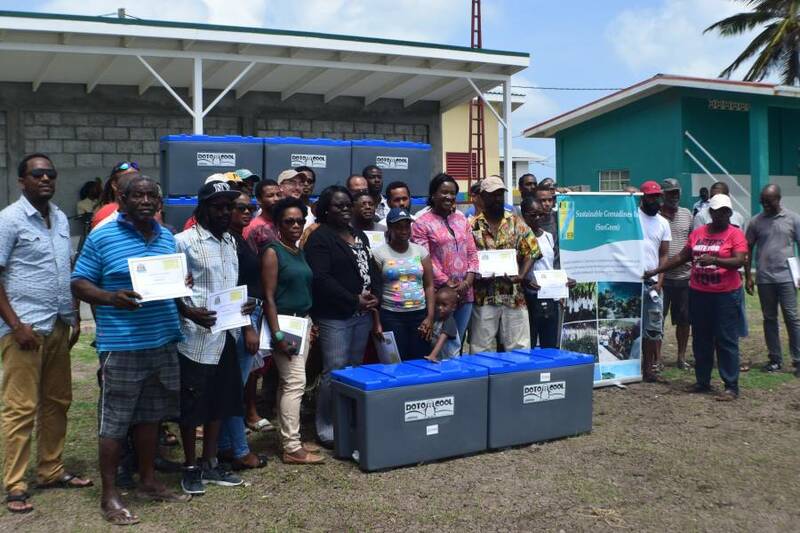 Fisheries Officer Junior McDonald who conducted the training noted that this will aid in increase landing and improve the quality of fish sold to consumers, as HACCP is essential for successful food businesses. The training was supported through funding by Sustainable Grenadines Inc. (SusGren) and USAID. SusGren Executive Director James Lord in his remarks said it is important that agencies such as theirs work together with fisherfolks to manage the resources of the sea. As part of the training the 45 participants each received an ice cooler.